Aluminium bi-fold doors are one of the most sought-after home improvements in the 21st Century. Transform your home in Norwich with a stunning bi-folding door in the durable, secure and low maintenance material – aluminium. Our aluminium bi-folding doors are a superb way of creating panoramic views with the large glass panels. 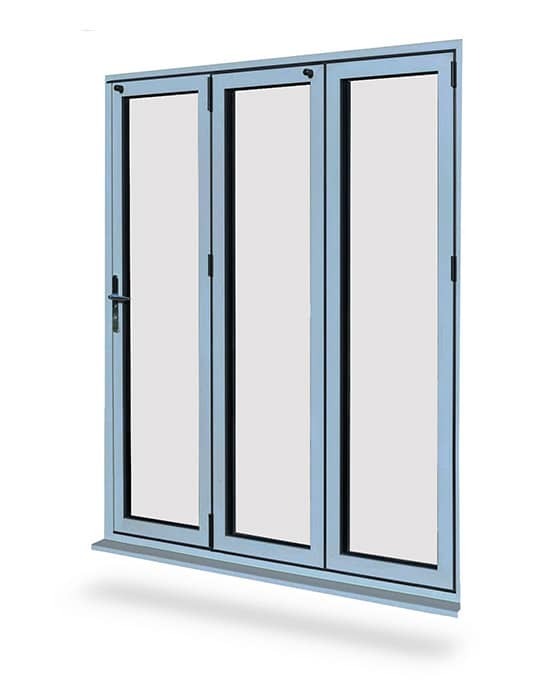 You will also have the option to fold your new aluminium bi-fold doors completely back to just a few inches. This is a fantastic way of creating an open plan living space, entertainment space or opening up a whole wall of a conservatory – seamlessly connecting your home and garden. There are many advantages to choosing aluminium over uPVC for your new bi-fold doors in Norwich. Aluminium is an extremely robust and structurally secure material. This is why we know our aluminium bi-fold doors will keep your home safe and sound and virtually impossible for unwanted intruders to enter. Our aluminium bi-folding doors also offer superb levels of energy efficiency. Designed using the latest polyamide thermal barrier technology your home will feel much warmer for longer. Locking the warm air inside your property is a natural task of your new aluminium bi-folds in Norwich. You can now get an instant online price for aluminium bi-fold doors using our aluminium bi-fold door cost calculator below! Alternatively, please feel free to get in contact with us via our contact form or give us a call on 01603 438 886 and one of our friendly and experienced team will be happy to assist you with advice and pricing guides.